Voluntary cooperation between health systems: are we getting the balance right? An ageing population, the increasing burden of chronic illnesses and the high cost of new technologies – for many years, EU Member States have been discussing the challenges faced by healthcare systems and exploring ways to ensure their sustainability. Reducing the cost of medicines is seen as one of the most efficient ways to contain budget expenditure. The European Council became a forum for discussion on the future of healthcare systems, and this is where the idea of voluntary cooperation was first introduced. Voluntary cooperation refers to different initiatives undertaken by EU member states within the last years. The initiatives might have different scopes and cover one or several areas of cooperation such as horizon scanning, information sharing, health technology assessment, pricing and reimbursement, and joint procurement. In general, through the enhanced cooperation and joint negotiations with the pharmaceutical industry on drug pricing, governments aim to increase patients’ access to high quality and affordable treatments in the participating in cooperation countries. The launch of Sovaldi (1) in 2014 was a catalyst for an enhanced EU debate on access to innovative medicines that are perceived as being high-priced. Since 2014, voluntary cooperation on medicines has been high on the political agenda of EU presidencies, inviting member states to explore opportunities for cooperation. Council Conclusions (2) on Innovation for the benefit of patients were adopted in 2014 under the Italian Presidency. These Conclusions invited member states to explore opportunities for cooperation on exchange of information between competent bodies. This position was reinforced under the 2016 Dutch Presidency, with the adoption of ground-breaking Council Conclusions on Strengthening the balance in the pharmaceutical systems in the EU and its Member States, where ‘voluntary cooperation’ is mentioned 8 times. Member states were encouraged to explore the opportunities that voluntary cooperation on medicines can bring to their healthcare systems. The Maltese Presidency in 2017 adopted Council conclusions on Encouraging Member States-driven Voluntary Cooperation between Health Systems. The Bulgarian Presidency (Q1 2018) is not lagging behind, with pharmaceutical policy as one of its priority areas. It intends to focus on the affordability and quality of treatments in the context of the needs and budgets of member states. With this background and a continued commitment from member states to work together in the field of healthcare, what can we expect to happen in 2018 and what impact will this have on the pharmaceutical sector? Since 2015, EU member states have been forming clusters of countries with the stated aim of improving patient access to medicines. The adoption of official declarations of intent and memoranda of understanding, making public announcements and signing of partnership agreements makes the voluntary cooperations seem very formal and highly political. But there are no clear objectives, structures or processes in place. The clusters vary in scope and membership, are disconnected from geographical and cultural links and are sometimes overlapping. The first pilot projects (focused on innovative medicines) run within voluntary collaborations have revealed the difficulties for governments to set aside their individual objectives, specific country needs and different negotiation practices in order to arrive at fruitful conclusions. Contrary to its objective and because none of these collaborations recommend a mandatory use of the outcomes of their activities by participating member states, it could be argued that voluntary cooperation could actually be slowing down patient access to necessary medicines by duplicating procedures: one within the voluntary cooperation and a second at individual national level. This calls into question the benefit of collaboration if the intention is to improve access to medicines, rather than just increase bargaining power – will this mean that the current modus operandi, based on bilateral negotiations between a country and a pharmaceutical company, will actually never change? There is uncertainty around the future of the collaborations and how they will operate in practice. This, combined with the lack of transparency represents a challenge for pharmaceutical companies. Italy has also cautioned against allowing the different cluster approaches to lead to discrepancies across the EU and has recommended communication between the groups. Other countries have called for an increase in trans-national cooperation as a way to negotiate sustainable prices, the strengthening of information exchange and mechanisms to reduce medicines shortages, using cooperation to inform national priorities and plan for the future, and expanding current agreements to increase purchasing power. 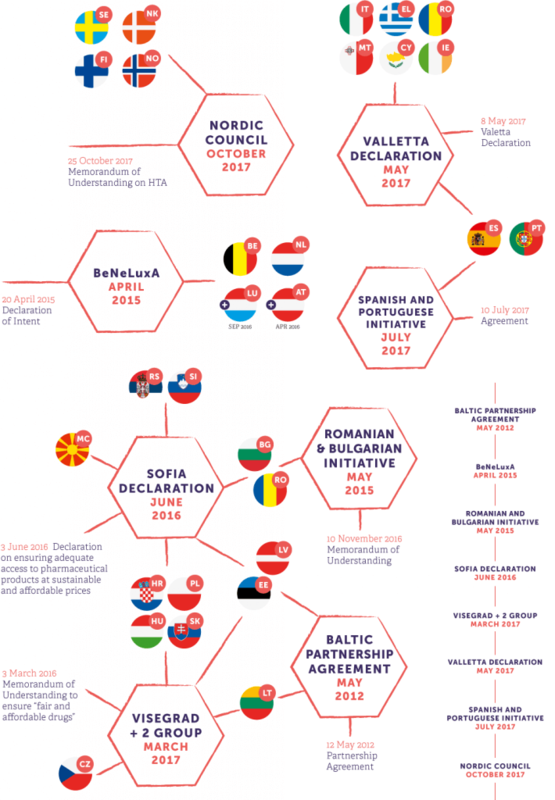 With the majority of EU member states committed to voluntary cooperation, and requesting political support from the European Commission, and with concrete experiences being collected through pilot projects (though unsuccessful), these collaborations are likely to move to the next level and become more operational, despite obvious fragmentation. The countries have already understood that conducting joint pricing negotiations on innovative medicines is difficult and the focus is now on mature products such as biosimilars and generics. The Nordic Council is conducting its first pilot projects and Spain and Portugal recently announced their intention to conduct a pilot project on joint tendering of generics and biosimilars. As for the future of country clusters, they are likely to stabilise within the next months, with each country restricting itself to one of the voluntary cooperations (which is not the case now). The Nordic Council represents best practice in terms of structure and having a process in place. With increased dialogue between different clusters, it might be replicated by others. Once a clear process and structure are in place, and successful pilot projects on biosimilars/generics are accomplished, countries will be able to build on their experience and may find it easier to collaborate on innovative medicines. If this happens, collaborative negotiations could become standard practice. Companies should foresee and prepare for a potential new modus operandi in pricing and reimbursement negotiations across Europe. To ensure that new practices are (a) driven by the desire to facilitate patient access, (b) do not impose an additional burden on companies, (c) have an adequate level of confidentiality, and (d) are conducted on voluntary basis, industry needs to be active in development of these collaborations and prepared to be part of pilot projects. The move towards increased country collaboration is a reality and now is the time for industry to shape the future environment. (1) INN- sofosbuvir, Gilead Sciences International Ltd.
(2) European Council conclusions are adopted during each European Council meeting. They are used to identify specific issues of concern for the EU and outline particular actions to take or goals to reach. Hanover Health has a dedicated group of consultants with in-depth knowledge of current pan-European healthcare debates. With a clear understanding of the latest development around joint voluntary collaboration on medicines, especially thanks to our presence in national markets in Ireland and the UK, we can support our clients on how to navigate within the different clusters and foresee the potential impact on their business. Please contact Emma Eatwell, EU Healthcare Director, to discuss how Hanover can help your organisation.